The years 2000 represented a tremendous shift in the way people wish to interact with brands. Being a powerful brand is not enough anymore. Several examples has showed that empires of one day were completely washed away the next day. People want to interact with Brands in ways that we would never imagine and the luxury industry needs to be ready for a real revolution. Otherwise, as a luxury brand, you might see it coming. When Georges Eastman founded Eastman Kodak in 1888 in the USA, he was far to imagine the amazing empire he was about to develop. During most of the 20th century Kodak held a dominant position in photographic film, and in 1976, had a 90% market share of photographic film sales in the United States. The company’s ubiquity was such that its tagline “Kodak moment” entered the common lexicon to describe a personal event that demanded to be recorded for posterity. For several decades, Kodak was a very powerful brand, used by families to immortalize amazing heart-full moments as well as used by professionals in Fashion or in any other visual arts industry. It became almost a part of your life. So nothing could go wrong with this empire. Well, until all went wrong. By 2012, the company had a revenue of $4.11 billion and still that year Eastman Kodak went bankrupted. Most of analysts and experts said the company did not embrace the digital revolution. The fault was on technology. I tend to believe that the fault was on the company leaders that missed the most important thing: what your company stands for? Here is an interesting fact. That same year, 2012, Instagram was bought by Facebook for $1Billion. This happened only 2 years after Instagram launch. As you know Instagram is a mobile app and a social platform allowing users to take pictures, apply cool and trendy filters on the pictures and share them accross the Instagram platform and beyond. Guess which graphic filter was the most popular at that time on Instagram? Polaroid. So what we learn from this is that Kodak was not about technology, cameras or even films. It was about the experience they were providing to millions of people around the world. Instead of celebrating the user experience, Kodak focused on technology and technology killed Kodak. This shows that it is careless to have an iconic product and a strong brand if you do not cultivate what is important for your customer. Another interesting case study is the former video giant in the US: Blockbuster Video. Founded in 1985 as Blockbuster Video and changed in 1996 to Blockbuster Entertainment, it was by far one of the biggest successes in the US soil as owned retail model. Blockbuster would rent videos VHS, DVD, Blue-rays and even video games. At its peak in 2004, the company had 60’000 employees and 9’000 stores across USA. Blockbuster was known to be tuff negotiators but definitely they also lack of vision about the future of homevideo. In the early’s 2000, Reed Hastings, CEO and co-founder of Netflix, proposed to sell the company to Blockbuster. At that time, Netflix had started its business by renting DVD via snail-mail. People would connect online, choose the film and get it by post. Once the film was watched, the user would send it back by post as well. Netflix was struggling with the DVD system. They came at the end of a technological cycle in which well established brands were running the market of homevideo. So Netflix was loosing money. In order to maintain the company, they sent an acquisition offer to Blockbuster. The American giant of homevideo could have purchased Netflix for $50 million. Today Netflix is worth $19.7 billion. With the arrival of online video on demand, better streaming video conditions and television being a tremendous entertainment broadcaster, Blockbuster missed the gap and completely lost it. By 2013, the entire company was ruined and all stores closed. Netflix in the same year had 40 million users in 40 different countries for $4.37 Billion sales. This shows that even if you own the last mile, which is the customer relationship, your business might be lost for ever if you miss the vision and simply technology innovation. As we can see, lack of vision about your business, your customer’s relationship and innovation can conduct a brand from top leader to bankruptcy. Kodak and Blockbuster are 2 interesting examples as nothing could not possibly go wrong and still, both companies went down the hill. Today there are other companies that completely lost it and try desperately to survive. 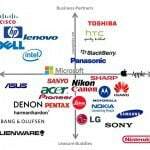 We could quote Sony and Nokia, 2 amazing companies, leaders in their markets and now almost at the edge of failure now. what camera was used to film it? which technology was used to edit the film and even to export it online? No, actually you just want to see the video, enjoy the experience sent by your friend and perhaps being able to share it as well. This means that the EXPERIENCE is the key. At the end of the day, people do not really have a need for brands and products. We have enough of them now. In many industries, we cannot really say that brand A has better products than brand B. It is all about which product will better fit your needs and what kind of experience are you looking for. The new generation accessing the marketplace now, 18 to 34 years old, have never been so powerful in terms of game-change. The new generation has quit the phantoms of past consumerism and ideas of social success for example has evolved a lot. The new generation individuals know what they want, are hyper-connected and informed, are not necessary ecologists but eco-responsable and enjoy the possibility to live experiences. Only in the USA, there are 77 million young adults with a annual revenue above $100K (source: Forbes). These people want to enjoy life, buy products and services but above all, they want unique relationships and experiences with brands. They rather prefer to go to few music festivals and concerts but each time, they wish a VIP experience that they could share afterwards. Companies and brands who understand this new deal, will grow very fast and become market leaders in less than 4 years. When UBER was launched in 2009, they had great ambitions for the company. Evaluated today at $18.1Billion, it became in less than 5 years, one of the biggest success in terms of business. Their idea was to bring a full disruptive approach of Taxi business. While most of Taxi companies would focus on their own assets (cars, drivers and licenses), UBER focus in one single thing: the User. By owning the users info and “wallet”, Uber can control the way people wants to experience taxi booking. They adopted a strong 2.0 approach and took over a considered business from traditional taxi companies. In August 2014, UBER is available in 45 countries and more than 200 different cities. Another interesting new company is QZ.com, Quartz. They completely redefined the way people would interact with news. The website it self adopted a more tailor-made approach with evolutive menus and basically no homepage. Just an endless scrolling of articles, like a Facebook timeline. They hired the “creme de la creme” in terms of journalists and editors. One of the main breakthroughs for Quartz is their newsletter called The Daily Briefing. Every morning subscribers receive their “first email of the day” in their email boxes. It happens generally around 06:30 AM. An experienced editor will curate news from Quartz but also from other media owners in order to provide you the best news experience ever. The website was launched in 2012 and in less than 2 years accomplished to be as big as Time magazine online. Quartz growth is exponential as it matches brilliantly what people is looking for. The quality and the relevancy of the editorial joined by the idea of an ultimate user experience, makes it the biggest news success in the past 2 years. As you can read, business models can vanish away because brands might not take in consideration the most important, which is the user experience. Millennials have very high expectancies and brands should propose experiences in which it would sound exclusive. As we say, in each project we should always target the moon because if you fail, at least you will end up among stars. Info sourced at the different brands websites and wikipedia. All content is copyrighted with no reproduction rights available.